October is Breast Cancer Awareness Month. Because 1 out of 8 women will be diagnosed with breast cancer during her lifetime, it's quite likely that you or someone you know has been impacted by it. We are very lucky to have a fantastic resource in Davis for women diagnosed with breast cancer and their families, Thriving Pink. 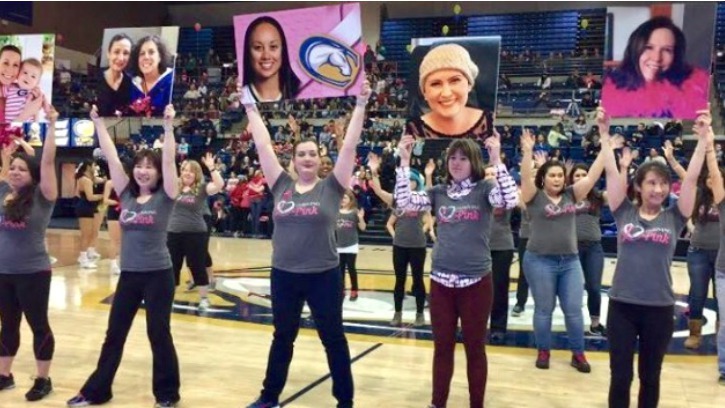 I first heard about Thriving Pink in August 2016, when I was invited to participate in its dance flash mob, Flashing Pink. Wanting to learn more about Thriving Pink and all the different things that it offers to our community, I asked its founder, Mary Yin Liu, to answer a few questions for me. What is the story behind Thriving Pink? Why did you start it? I started Thriving Pink in August 2016 honor of my friend, Ann Murray Paige, who passed away from breast cancer in March 2014. I was personally inspired by her and so many women in our community. She had a vision - that we are all in this together and we need to "show up" for each other. During the six years of our close friendship, I believed in her vision. Over time, her vision became my vision as well and I searched for a way to make that vision a reality in our community. A few weeks after we opened our office, a woman walked in and shared that she had just been diagnosed with breast cancer and was searching for support and resources. She had not yet informed her family or friends, and no one in her family had breast cancer. This is often the case as over 85% of women with breast cancer have no family history of the disease. She was surprised to see a local nonprofit welcoming people to support one another through such challenging and often difficult circumstances. With 1 in 8, there are thousands of women in our community who will be diagnosed in their lifetime. No one should go through breast cancer alone. Our local nonprofit is committed to helping local women and their families in a meaningful and impactful way. Who is Thriving Pink for? Is it just for people in Davis? Thriving Pink is based in Davis as our office is located in Davis Downtown. Although our programs and events are also in Davis, they are open to everyone who can join us. In this region, someone can travel to another city in just a few short minutes. For the Granting Pink Program, we give priority for women who reside in Davis or are treated in Davis as the funds are raised locally from this community. Mentoring Pink (one on one mentoring with a Pink Peer, an annual Renewal Retreat, and monthly workshops), Flashing Pink (an outreach program with a flash mob dance series and informational booth), and Granting Pink (an individual grant program to help women and their families). We also partner with the community and other organizations, such as Camp Kesem, to host special events, including Community Day. One special event we are planning for next year is the Pink Gala. We will be honoring all the Granting Pink Awardees and we invite everyone to join us. I think we are all connected to someone - a mother, friend, daughter, or neighbor - someone who has shared their story and journey with us as they face this diagnosis. It's important to celebrate milestones and honor those near and within our hearts. How can people volunteer or donate? Our website ThrivingPink.org has a Give page for donations, and we encourage interested volunteers to contact us by email at Info@ThrivingPink.org. We are also hosting a Volunteer Night on Thursday, November 9th from 7 - 8:30 pm. We will be filling Comfort Bags to donate to local hospitals and newly diagnosed women. We also welcome volunteers throughout the year to join us at various events. There is something very empowering about giving back and helping others. The opportunity to give is actually a beautiful gift. Several of our board and committee members are breast cancer survivors. They have been there and have a great desire to help others. Several past Renewal Retreat attendees returned this year as volunteers to welcome and support the new attendees. We are growing and there are always opportunities to connect with us to serve. We welcome everyone to join our Pink Team! What else do you have planned for Pink-tober and the coming year? We will be at the International Festival on October 1st at Central Park with our informational booth and Flashing Pink. We are also inviting the community to join us for a Thriving Pink 5K Walk FIT starting at 9 am on Saturday, October 14th. Jennifer Miramontes form FIT House will lead us on a scenic walk to the arboretum from FIT House and our office. A reception will be hosted afterwards. Sola Bee Honey and Stella & Dot will participate in the reception also to support fundraising for Thriving Pink. We just hosted our 2nd Annual Renewal Retreat in September so the 5K Walk is a perfect time for those women to re-connect with each other, as well as the Grant Recipients. And, it's a wonderful opportunity for the community to come together to rally and support our thriving community in October, National Breast Cancer Awareness Month. Our Granting Pink applications are also available starting October 1st. Someone can nominate a friend or relative to receive the grant as well. We awarded $20,000 to 18 women last year and we hope to increase the funds granted next year to at least $25,000. We do not want to turn anyone away. The nurses at Sutter Hospital started a kitty fund with dollar bills and spare change in a glass jar to help their patients with basic essential needs, such as prescription refills, gas for medical appointments, and dinner for their family. Several of our board members are in the medical field and know first-hand how a financial burden can overwhelm a family, especially when one parent cannot drive or work due to their treatments. We know there's a great need out there and we want to do everything we can to help. Do you have a message that you want to share for those with breast cancer? For their family and friends? Just that we are here and we will continue showing up to support our thriving community. We encourage folks to reach out to us, to come to an event or gathering. We look forward to connecting with you and creating a strong network of support for our community. Do you have a list of other local resources for women with breast cancer or their families? We do not have a formal list of resources. This has been personalized with support provided on an individual level by Pink Peers as part of our Mentoring Pink Program. As we are growing, we would like to start to develop a formal list of resources in the future as we think that would be helpful, especially for newly diagnosed women. Contact Thriving Pink if you need support, to donate, or to volunteer by emailing Info@ThrivingPink.org or by visiting their website, www.thrivingpink.org.